Discussion in 'UFC Discussion' started by Aegon Spengler, Aug 5, 2015. It's a big money fight, and Dana is hedging his bets. If Conor loses to Aldo, Conor can main event against Faber in a "grudge match." If Conor wins, Faber will be 1 win away from a title shot. Faber should fight on the same card as Aldo vs McGregor. 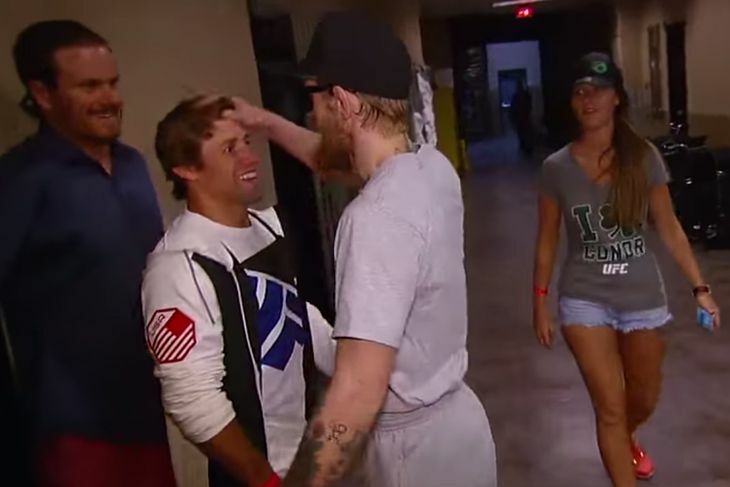 If Faber wins on that card and McGregor wins, Faber can challenge McGregor afterwards. It's a fight that will draw a lot of interest because both guys have large fanbases. Edgar will then say McGregor is ducking him, he'll be waiting in the wings, and that fight will build hype and interest. Conor will likely beat Faber and by the time he does the calls for Edgar vs Conor will be at a fever pitch. I can see it. Because Edgar is a dirty first title defence. Especially in Croke Park. Dana will give us a head clean off sacrifice in Dublin. Faber likely. I'm a huge Faber fan going back to his WEC days. But you are delusional. At this point, Faber is basically Mendes with less one-punch power and less explosive takedowns. Conor finishes that fight in one to one and a half rounds. Poor Edgar, when he'll get his DESERVED TS ? Sorry TS but if Connor will be heading to LW sooner than later, especially with the IV ban. Faber is one win away from a title shot at featherweight? Has this thread been bumped from 2007? I believe that Aldo is not going to fight and Conor will have to fight Faber. Why in the world would Faber jump over Edgar for the FW title??? He's nowhere close to a title shot and there are a few guys ahead of him. I could see it too, except I'd describe it as protecting Conor since Frankie is a much more logical match up, and there's no disputing that. Do we really need to watch Faber come up short (No pun intended) AGAIN in another TS? Besides, Frankie just dismantled him. McGregor v Edgar. There is no other fight to make really. Would love to see that fight happen as some point in time. If anything, let's see the rubber match between Cruz and Faber. I think the Domin8er needs a warm up fight before getting in there with Dillashaw. How much longer do we have to wait on the Korean Zombie? I want to see him and McGregor.